Ascending tract is a part of sensory pathway. Sensory pathway transmits sensory inputs (impulse) from peripheral receptors to concerned sensory areas of brain through chain of neurons. Mostly the chain is made up of three neurons called neurons of first, second and third orders. 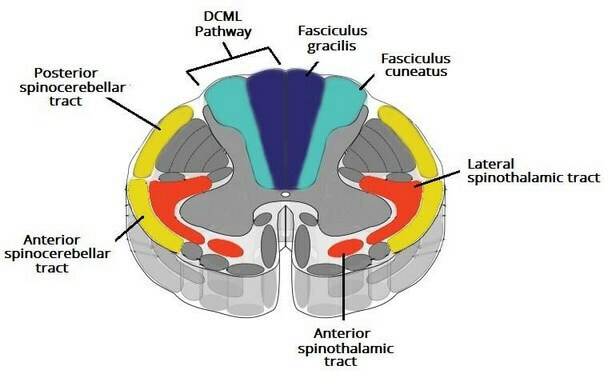 It terminates in different laminae of posterior gray horn of spinal cord to relay in the tract neuron. These are short primary sensory neurons. Axons of some primary sensory neuron (called long primary sensory neurons) run vertically upwards through white matter of spinal cord to relay in some cell groups or nuclei above thelevel of spinal cord, e.g. nucleus gracilis and nucleus cuneatus of medulla oblongata. Axons of tract neurons of spinal cord and axons of long primary sensory neuron, as compact bundles, carrying one specific type of sensation (exteroceptive or proprioceptive), ascend through different funiculi of spinal cord to form ascending tracts. Second order neurons are therefore tract neurons of spinal cord, or some nuclei above spinal cord, where long primary sensory neurons relay. Third order neuron is present in the thalamus in the form of different nuclei receiving inputs for different sensations. Axons of third order of neurons finally send projection fibers to sensory areas of cerebral cortex. A tract, as classified below, may carry either exteroceptive or proprioceptive sensation. Again one may transmit sensations of both these kinds.Before further study of ascending tracts, it is important to note following points. Only major ascending tracts from above table are described below. All ascending tracts (so also descending tract) are bilateral, and symmetrical in position in both side. Fibers of adjacent tracts may present overlapping. Some of the tracts are uncrossed (ipsilateral) and some are crossed (contralateral). Decussation (crossing) occurs mostly at the level of spinal cord. Some cross in supraspinal level. For example, ventral (anterior) spinocerebellar tract crosses at the level of midbrain. Ascending tracts are described below only upto the level of their primary destination beyond spinal cord. Their further course has been mentioned while studied cross section (internal structure) of different levels of brainstem and forebrain.